Guilt is defined “remorse caused by feeling responsible for some offense”. We all have it and especially when it comes to our clutter. Mental health professionals would agree that guilt can weigh us down and bring with it some less than ideal side effects. Imagine ridding yourself of not only the clutter in your space but also of the guilt associated with it! To do that, we must first understand it. We experience guilt clutter when we pay a lot of money for something we never use. Usually big ticket purchases seem like a good idea at the time but end up relegated, unused to some corner. A very good example of this is a treadmill. It is possible to spend several hundred to several thousand dollars on a treadmill. So you make the investment in, assuming, your health but fail to use it. This creates guilt not only that you aren’t exercising but that you also made such a large, wasted, investment. You keep it because you either intend to use it someday or simply paid so much money for it you believe you won’t be able to recoup any of it. All of these feelings drain your emotional energy and take away from your enjoyment of life. 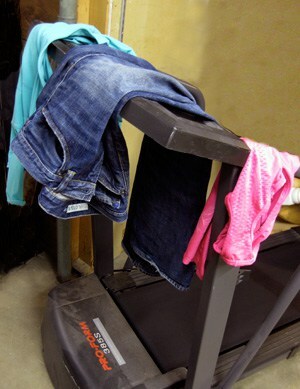 If I were standing there with you looking at this treadmill, I would ask you “what keeps you from using it?” and “what is the worst thing that could happen if it were to go away?” The bottom line is if you don’t use it because you would prefer to walk outside in the fresh air then let it go! If the worst thing that could happen is you are out a few hundred dollars then let it go. Sell it on Craig’s list or contact a local auction company to take it off your hands for you. Either way, you will be happier in the long run. Another very real form of guilt clutter is the gifts we receive. We all get them…gifts for which we appreciate the thought but would never use in a million years. A very good example comes to mind from a client a few years ago. She had two (very ugly, I might add) martini glasses. She had already mentioned that she doesn’t drink any alcohol yet keeps these two glasses. She said they were a gift from a friend and wanted to have them in case she came over one day. I told her “things break”. She laughed but understood. The reality is even if the friend did come over, it is unlikely they would drink iced tea out of the martini glasses. There is no reason for her to keep them. I do, however, recommend re-gifting when possible just be smart about it. The best thing to do though is to tell the generous gift-giver that although you love the thought, you would rather get her money’s worth by exchanging it for something you would actually use. They might be a little stung at first but in the end will most likely be grateful that their money wasn’t wasted. Honesty is always the very best policy. Guilt happens to all of us and the way to overcome it is to recognize it. Once you do, consider the steps to remove those feelings and feel better about your belongings and your space. Next story Falling Gracefully With the Autumn Leaves.